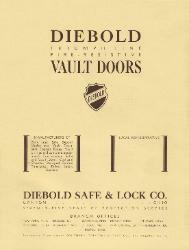 1934-Diebold Safe & Lock Co.
product catalog for Diebold Safe & Lock Co. It is 14 pages. Safes; Fire-Resistive Safes; and Tellers' Safety Locker. Diebold Safe & Lock Co.